My last two trips to PA were for family funeral services. I needed to head home on my terms for a change. 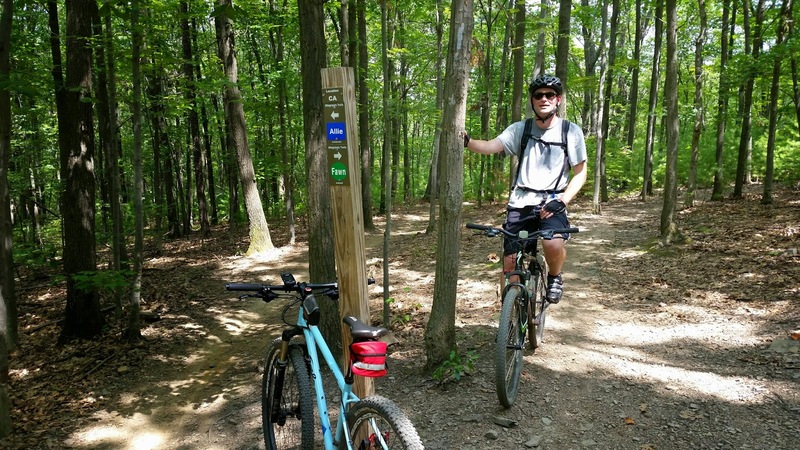 I opted for a short weekend getaway and a chance to ride some PA trails I've been hearing a ton of good reports on: Allegrippis Trails at Raystown Lake. I tossed one of my long time buddy's, Brant, an invite and he took the bait. 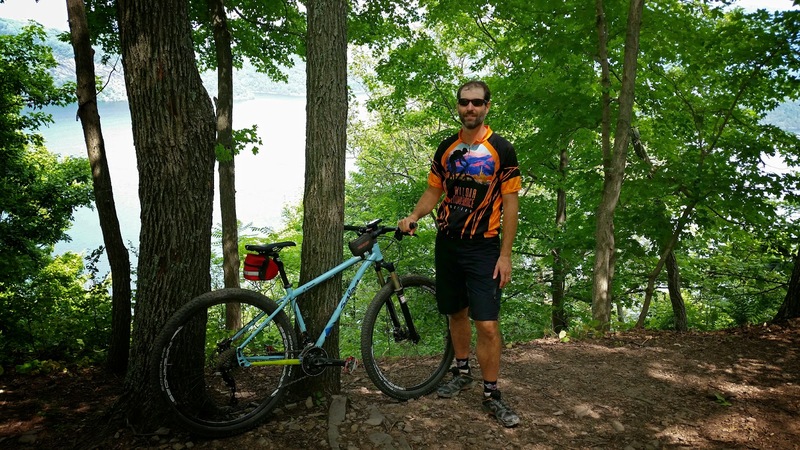 He's been doing some on/off again commuting and has a mountain bike so why not make a day out of it. The trails out there are non-technical by all accounts and we'd ride at a touring/picture pace. I simply needed a bike to ride. I did some poking around and found Rothrock Outfitters out of Huntingdon, PA and they had a rental shack right at the lake!! $30 scored me a Salsa El Mariachi 29er hardtail for the day. I also snagged a route suggestion from another local rider via the online forums. We were set. As the day approached, I hoped the weather would hold off as well, the forecast called for a 60% of scattered thunderstorms. A forecast like that in PA almost guarantees you'll get wet!! I jumped on the red-eye out of the desert on Thursday night, arriving in Philly bright and early. I made arrangements to meet up with an old freestyle BMX pal, Kev, for breakfast. We hadn't seen each other since I bolted the east coast for AZ back in '91!! It was great to get caught up and reflect back on our days riding the 20"ers around. You can see some of Kev's high flyin' antics in a post I did a while back" Rad Roots. A little older, but still goofy!! 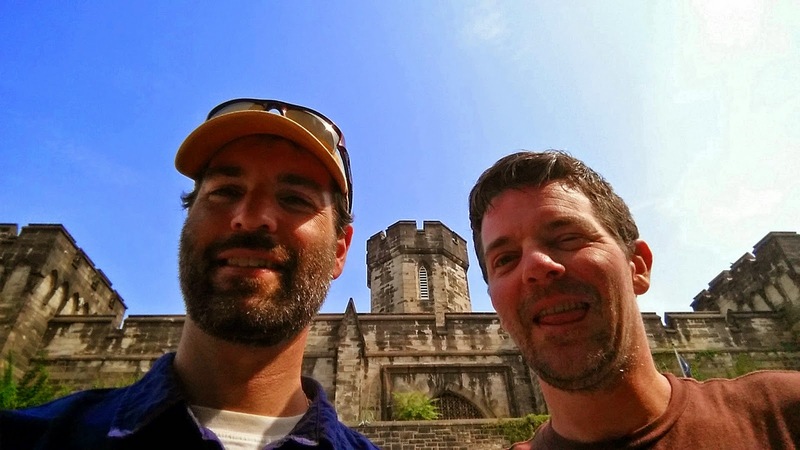 Standing in front of Eastern State Penitentiary. 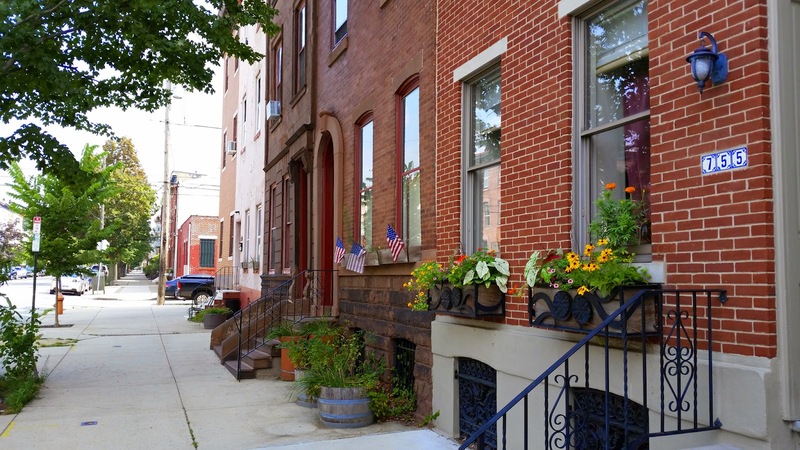 Mean streets of Philly don't look so menacing. After a few hours in Philly it was time to head north to Allentown. I was meeting another longtime friend, Rick, for lunch at a famous (at least to people of Allentown!!) 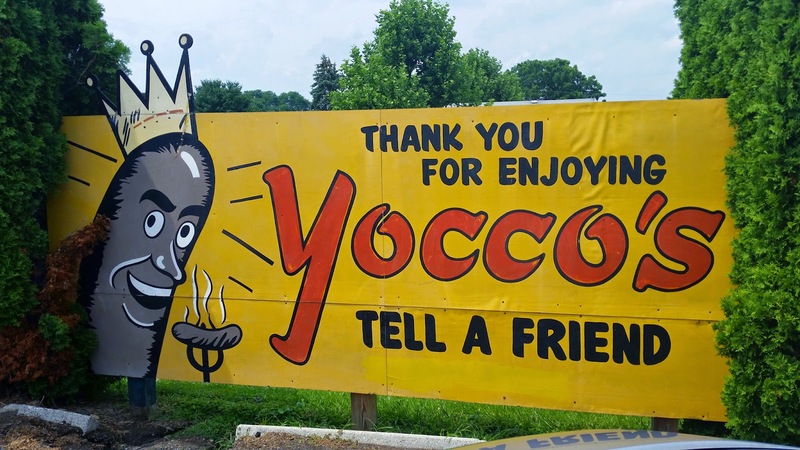 hot dog joint: Yocco's Hot Dogs! It's a mandatory stop when in town. Rick's toddler fell asleep before we could meet so I grabbed some dogs to go and met up with him at home. It was the first time I was able to meet his son and it was cool to see Rick relishing his role as Dad!! Brant finally escaped work for the weekend and we met up for a brew before finalizing our gear for the weekends ride. We hit the road bright and early, ok it wasn't all that bright - more like gloomy, but we were headed west to Raystown Lake. We arrived a bit after the 10a opening, picked up the El Mariachi and found the trailhead we'd stage our cooler at. We started right near the middle of the map, where the green & blue come together at the 'P'. 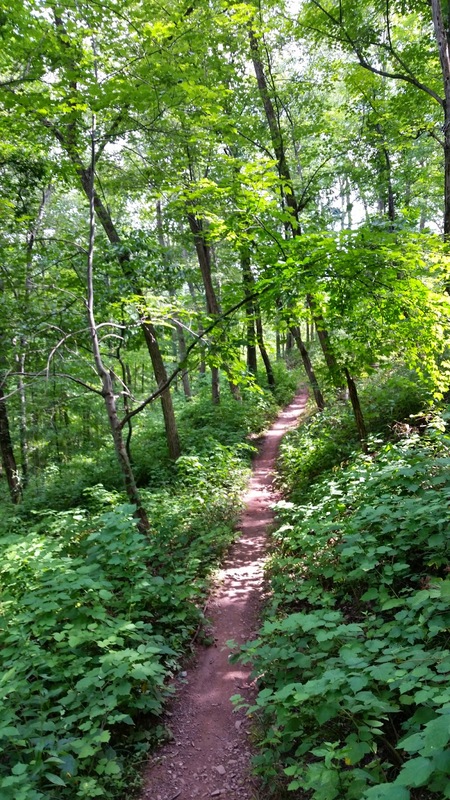 Almost immediately the trail pointed downward, swooping, carving and not needing to hit the brakes! Brant was keeping up pretty good, so we pressed on to the next trail junction. 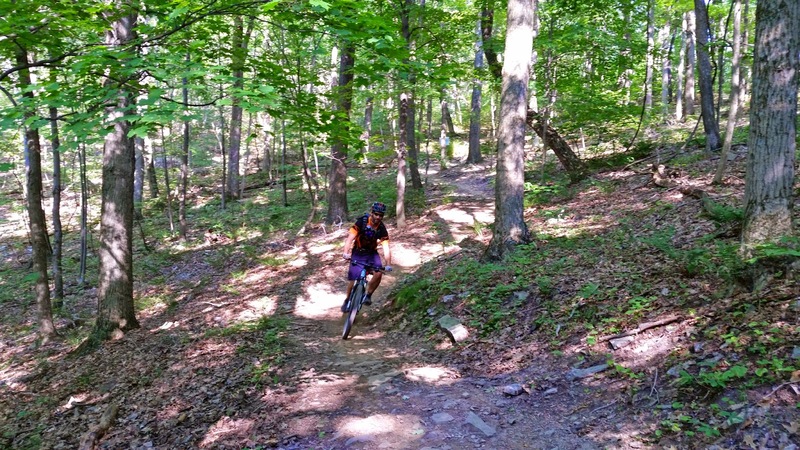 We rolled down the Osprey trail, full of whoops & banked turns!! Damn that was fun. The Hydro loop was more of the same, but I warned Brant that we'd have to pay the piper sooner or later for all these downhills! The thing was, even the climbs were fun! Well, at least for me they were. I found out early that these trails would be a dream on a singlespeed. We were back at the top of the Hydro loop much quicker than either of us thought. Let's do some more climbing!! Lots of smiles early on, still dry too! The sun started to poke out and weather wasn't really a concern. It was a bit humid, but at 72º, who cares!! I still thought we may get poured on during the late afternoon. Taking a break on the Hydro Loop. Not sure about the 'Most Difficult' designation, but it sure was fast & fun!! The El Mariachi back at the top of Hydro. This was the trail surface for the day. Came across a 5' Eastern Rat Snake crossing the trail. Only a few puddles here & there. We traversed across the Eagle trail and up Sleek Dog. At the top I could tell Brant was getting worked pretty good. There was supposed to be a nice overlook at the end of the next stretch of trail. I made sure we took plenty of breaks getting out there. I could tell he was about done, so I suggested he take an extended break while I knocked out a 6 mile loop since we still had 4 miles to ride back to the car. Posing with the rental steed. Landspeeder fun on Ray's Revenge!! Woohoo!! Picked up a tag along rider. How can you not ride fast here? Up I go, short, but the steepest climb of the day. I missed my turn onto Berrypatch, but decided to add a quick out-n-back (OnB) on Loco-Motive. Tack on another 2 miles and by the time I returned to Brant I had a bonus 8 miles in under an hour. Brant was all rested, ready for the return to the trailhead. We arrived back at the trailhead a little before 5p. Brant was whooped, but hung in there for 17 miles - his longest ride evah!! Way to go! Trust me, the next time it will seem easier. The rental shop was open until 6p, so I bolted for a quick OnB to the next trailhead, about 2 miles away. Shortly after leaving the trailhead I found something so foreign to the rest of the system: techy rocks!! It took over 25 miles to find some of this. 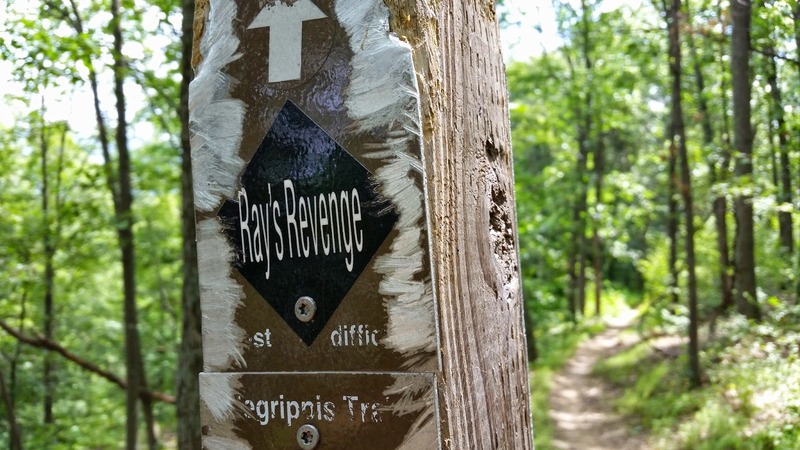 I kept a close eye on the clock, reaching the other trailhead on my scheduled turn around time. I made it back to our car, quickly swapped out the parts I slapped on the rental (pedals, feed bag, GPS mount) and we zoomed down to the rental kiosk. I scooted up to the window with 2 minutes to spare!! I had to make sure I got my monies worth from the Salsa. As you can tell by the photos, the weather held up just fine. No threat of rain the entire day, simply perfect. 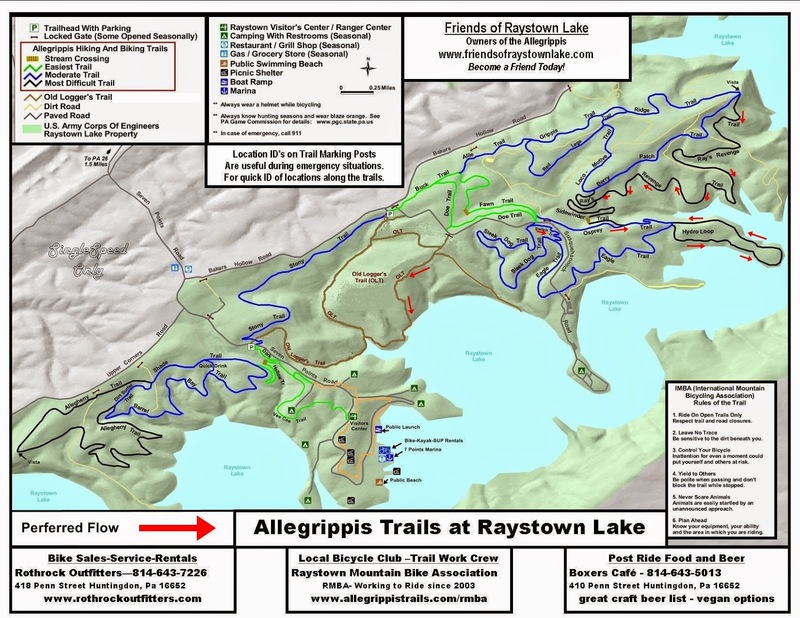 I'll definitely make the 3 hour trek out to Raystown Lake to ride again. I can't recommend this place enough. 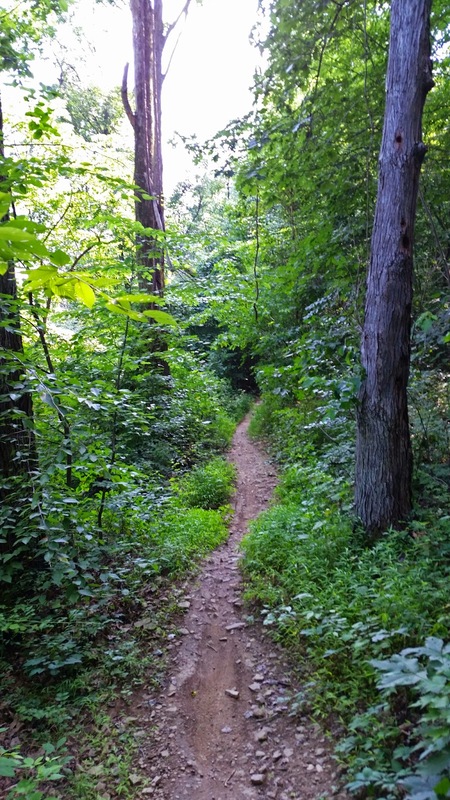 It was such a fun system of trails that flowed and flowed some more. 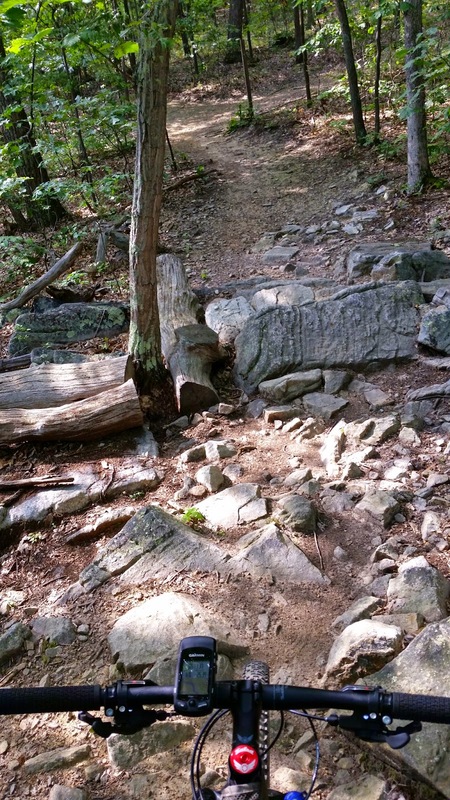 Granted, if you're looking for a technical challenge, this isn't the place, but there are plenty of trails north of here reportedly filled with rocks. I told Brant I'd love to come back and put together a Raystown 100, he just shook his head. But really, it would be a blast - do the route I did (29 miles) plus the one loop I missed puts a 'lap' at nearly 35 miles. Repeat 3 times!! I only had two things left to do before heading back to the desert. Have breakfast with my Mom and do some beer shopping!! 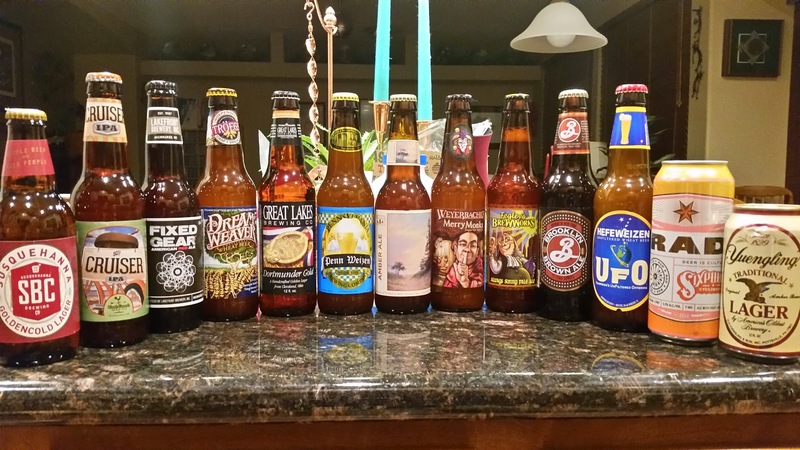 I thought I did pretty good on my beer haul. 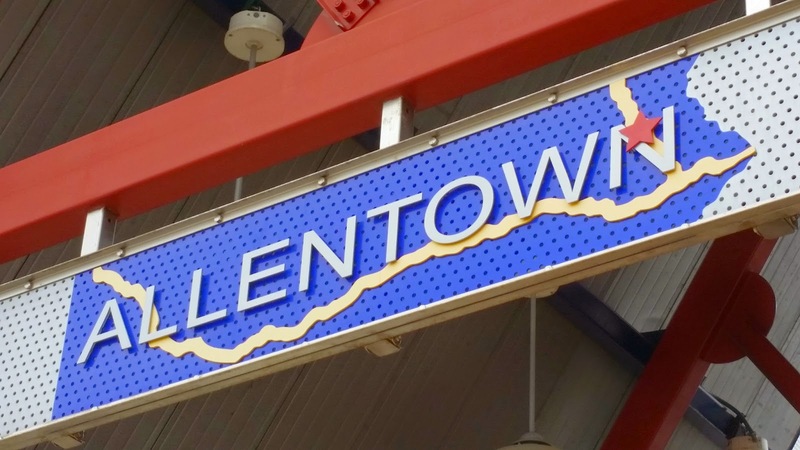 Adios Allentown, until next time. Of course my weekend wouldn't have been complete without a bit of a travel adventure. The first part was self-induced as I didn't quite give myself enough time to drive to Philly, gas the car, return the car & check my bags before the 45 minute cut-off time. I missed it by 10 minutes!! I told myself I wouldn't have gotten a standby seat anyway as the flight was oversold & I was 4th on the list. Unfortunately the next three non-stops to Phoenix were also full, but when it comes to standby travel, never leave the gate until the plane physically pushes back! The next flight proceeded to go on a 1 1/2 hour maintenance delay before boarding and to my surprise my name was called almost immediately. Boom! Seat 4A and for a second I thought I may have snagged a first class upgrade, but no, bulkhead instead. The crew made a couple of announcements for people to take their assigned seat so we could get going. Apparently some lady behind us had an issue with her seat location and couldn't wait until after takeoff to relocate. So what did she do instead? Locked herself in the lavatory!! 10 minutes later a few of Philly's finest escorted her off the plane, not a wise relocation effort. Here's another pro-travel tip: Upon landing, do not, get out of your seat while the plane taxis to the gate to retrieve overhead items!! This will make the crew cranky and yes this too happened on this flight!! C'mon people. Let's get back to the riding stoke. Cheers! !